Simply having a wonderful Christmas time..."
This post is inspired by flowersandcrowns. Lisa the beautiful girl behind this blog invented the idea of sharing other blogs/ instagram pages/ youtube channels and others to spread love to the world. And because it is Christmas, I want to follow that idea and show you my favourite instagram pages. If you have read my gym routine you might already know some of my favourites, but if not feel free to check it out afterwards. 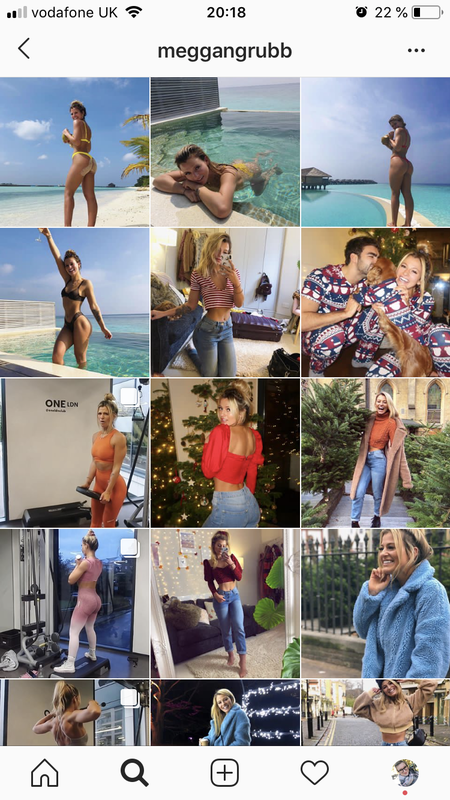 Scrolling through my Instagram is basically just like being in the gym with all those beautiful and inspirational, well dressed Instagram fitness influencers. I don’t know how to describe them, but you will see what I mean. I will show you my current 5 favourites! Robin is a very cute girl and I love her stories. She is so brave and strong. I followed her for a while and she got my attention because she took out her brust implants a few weeks ago because of brust implant illness and I think she looks so beautiful with or without! She is the girlfriend from the founder of Gymshark and they both are so cute together with their little dog. For me Natacha is unique! Obviously, she is doing fitness videos but she is not focusing on gym-workouts with barbells and building muscles. I always call her workouts the ninja style because she is doing a lot of compound movements for the wohle body and most of it with body weight. Some exercises I have never seen before and that's why I love her workout guide, because you are doing something new almost every weeks which moves the body to new movements building new muscles. As you probably have seen in my workout routing post I am following her guide cut and I still totally recommend this! She is the one and only reason why I started to go to the gym! I love her videos on youtube and every instagram post! She is amazing! 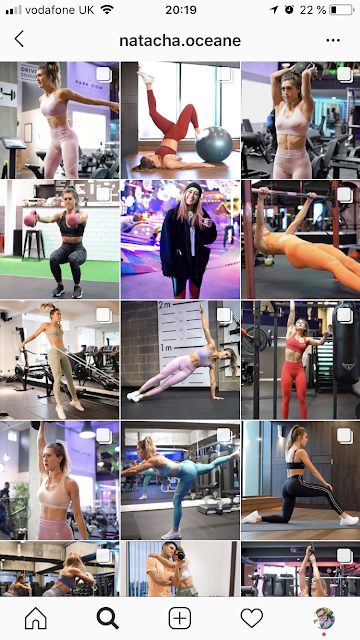 In my opinion Whitney Simmons is one of the most motivating youtubers ever and if I don't know what to do in the gym and I don't feel like following my guide, I just go on her page and search for the muscles I want to train. She is not just beautiful and funny but also honest and helpful in terms of food. If you don't understand why I love her, just watch her whitmas videos and you will understand! Meggan is so cute! I followed her guide in the beginning of the year and it was so great. ANd if you don't know her you have missed the most amazing booty on earth! I meant: She looks like goals! I think she is so motivating and what I really love about her is that she is posting a lot if HIIT workouts, which I have/love to do to burn calories. She (and her boyfriend) vlog their live a lot and it is so nice to see that even beautiful girls like her treat themself with chocolate, which is my excuse to eat as well. Hanna Öberg is my new discovery. I saw one of her videos on youtube and thought that this was the most helpful video I have ever seen. It was about common mistakes at the gym . And she showed what people make wrong and how to improve it. I'm always afraid that I am making mistakes because first I don't want to hurt my body and second I don't want anyone else to think I don't know what I'm doing - even if this is the truth. And I think her videos are the most helpful and funny at the same time. She is also one of the girls with more muscles and not just skinny, what I really like. And I think she still looks amazing and feminin! And if you already know them you see the pattern: all of those girls are Gymshark athletes. I love this brand and I wear their cloths every day to the gym! I found those girls through their Instagram page and They inspire me every day. If you want me to show you more of my favourites maybe about bullet journaling or others, let me know in the comments below! And again, this spread love idea is from Lisa from flowersandcrowns. I’m pretty sure you will like her blog! She is putting her heart into it and each post is made with love. She is an amazing women and I can recommend you hear blog from the bottom of my heart!